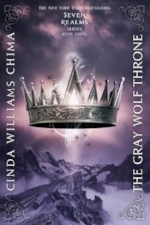 New York Times and USA Today bestselling author Cinda Williams Chima’s YA high fantasy Seven Realms series launched with The Demon King(2009), followed by The Exiled Queen (September, 2010) and The Gray Wolf Throne (August, 2011.) The Crimson Crown is scheduled for fall, 2012. Chima was a recipient of the 2008 Lit Award for Fiction from the Cleveland Lit and was named a Cleveland Magazine Interesting Person 2009. She lives in Ohio with her family, and is always working on her next novel.